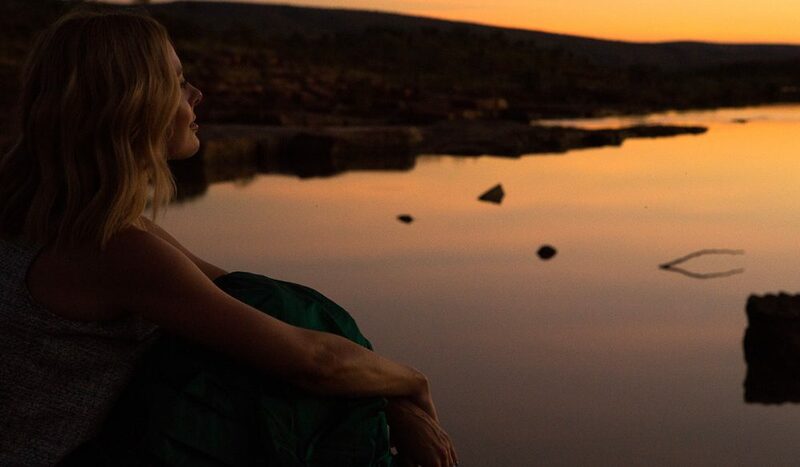 Last year, whilst on a trip in the Kimberley, we came across the vast – and vastly remote – Mornington Wilderness Sanctuary. The story we found there was both heart wrenching, and heart-warming. To help spread the message, we asked 60 Minutes reporter (and ardent Kimberley fan) Allison Langdon to join us on a trip there. Of course, that does not mean that journalists are insurmountable. Even the hardest of noses can, on occasion, be at a loss for words. Take the scene that greets us at the beginning of this tale, for example: where Allison Langdon – arguably one of Australia’s most outstanding examples of this profession – is confounded by a sudden silence that not so much as gently descends, but crashes through the car window, snatching breaths as it whooshes through the vehicle and out the other side. In fact, in the seconds afterwards, as four passengers grasp the air for phrase, it is not Langdon, but our wilderness guide, Laura Smelter, who first manages to react. “This is a lifer,” she murmurs into raised binoculars. But even she did not expect this to happen. Though, having just arrived at Mornington Sanctuary, a wedge of ancient landscape and jurassic proportions in the deep heart of the Kimberley, not two days earlier, we had joked about it. High on fresh air and the fact of our sheer remoteness, conversation had turned with speed from our long drive here (spectacular, if you were wondering), to the upcoming highlights of days in front of us: the dramatic, glossy waterholes we would swim in, the giant valley of boab trees we would visit, and the unicorn of the bird-watching world, which we would never see: the gouldian finch. Yet, right here in front of us, flitting about the rocky bed of a creek trickling with typical dry-season slowness, is the almost-impossible: not one, nor two, but three of the sylph-like creatures, as kaleidoscopically coloured as their reputation would have you believe, and at least twice as lovely. They drink from the pure shallows whilst twittering sweetly and hopping prettily about; behaving, despite our mad fumbles with cameras and cords, as though nothing could be more ordinary. For all its unexpectedness, however, you could not have engineered a more appropriate introduction. Established by the Australian Wildlife Conservancy (AWC) in 2001, Mornington Sanctuary is a rare stretch of landscape; one of Australia’s last remaining vestiges of ‘pure’ nature, where ecological harmony remains a priority above all else. 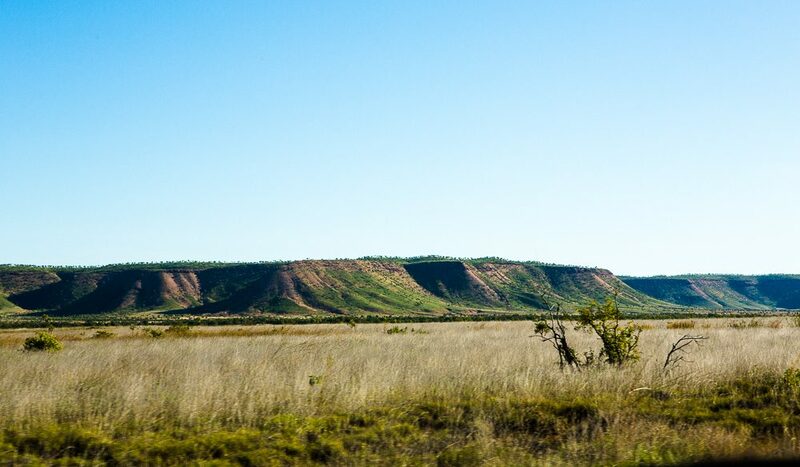 (If you are about to point out that the entire Kimberley is a ‘pure’ wilderness, allow us to furnish you with a less fortunate truth: the vast majority of this area is, in fact, operating under pastoral lease, which has resulted in serious damage to the natural balancing act – a particularly devastating fact when you consider that many of the cattle stations in the area are not particularly profitable). Here is where dwindling native populations like the gouldian finch come to seek final shelter, in a last attempt to avoid the calamitous wave of extinction flooding our continent. One visit later, in which we had learnt of the Mornington story and seen some of the most extraordinary sights of Australia, we were expeditiously planning our next trip here. 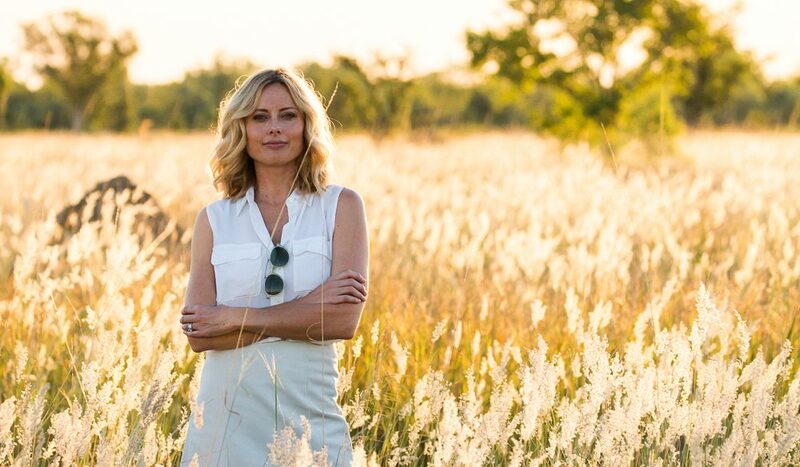 And who better to return with – and help cast attention towards Mornington’s conservation efforts – than someone already so intimate with its associated challenges? It is a shimmering afternoon on the savannah plains when we settle into conversation on the topic. Langdon, speaking between photographs, is positively luminous in the afternoon light, though characteristically unaware of it (or more accurately, maybe, actively ignoring it: one gets the impression she has deliberately cultivated a dismissive attitude toward her looks; perhaps as a defense mechanism to the attention they would have no doubt initially garnered in a testosterone-dominated newsroom). Though this is her first visit to the sanctuary, it is not, by any stretch, her first trip to the Kimberley. That privilege dates back to her early 20s when, while working in Channel Nine’s Darwin newsroom, she took a helicopter to Mitchell Falls. She is well-qualified to say so. “I like to think that I’ve been to a fair few cities and countries,” she agrees – an understatement from someone who, just minutes ago, hilariously recounted a tale about having maggots fall on her head during an interview, whilst living on board a rickety old boat with 17 sea gypsies in Borneo. She is well-qualified to speak about this, too. As you might have observed, Langdon has, since joining 60, devoted a marked amount of time to shooting wilderness-related stories: it’s an area she is personally passionate about. Travelling to the obvious hotbed of conservation issues, Africa – a continent she visits regularly – has only made her more aware of Australia’s good fortune, she continues. Over in Kenya, a prominent American conservationist, Dr Lawrence Frank, has devoted the past 40 years of his life to studying a number of the area’s predatory species. Langdon recently travelled there to interview him on his work involving conservation of the local lion population, and walked away with a profound sense of urgency about humanity’s current situation. Cripes: a fairly dire prediction, isn’t it? each smudging into a horizon of striking ranges, which lap like lazy waves at the far edges of Earth. Such claims sound like the sorts of half truths you might hear from a politician, but a conservationist? Surely not. Yet how can such things be true? Then why, with all these incredible results, has no one heard of AWC? “Because it’s funded by mums and dads and philanthropists. Our money goes straight back to conservation.” Even the AWC’s most publicly-known board member, Tim Flannery, has publicly appealed for donations on occasion: such as in 2009 when, speaking at a fundraising event, he summarised the Australian situation as a “biodiversity crisis”. for starters, almost 80 per cent of its staff are based in the field; a much higher proportion than that of similar (perhaps more bureaucratically-minded?) counterparts. We’re sitting in the open-air restaurant after a typically generous breakfast – scrambled eggs, olive oil mushrooms, toasted muesli, sliced fresh fruit and so on – when she pulls up a map of the Kimberley on her laptop, in response to my queries. “These are the movements of Bruce the cat,” she says, pointing to a series of dots. “His original home is here” – she points to the west of the map – “but then a really intense wildfire happened here.” She points to another spot, around 15 kilometres away. “Fires like that one – the same kind of fire that Turia Pitt was caught in – are unplanned, unpredictable and extremely intense, and they totally strip the landscape bare of shelter and food, leaving native animals nowhere to hide and nothing to eat. The result, she says, is an increase in the already devastating number of small native mammals eaten by cats each day. The story she tells next is quintessential outback stuff, involving sitting down with the neighbours, several cups of tea, and a very large map. “Basically we all got together and worked out a fire management plan that benefits everybody,” Smelter explains. “Using a helicopter, we burn in a continuous mosaic pattern at the beginning of each dry season, when there is still enough moisture to ensure cool, patchy fires, as opposed to intense wildfire.” And it’s working. It is two o’clock on another bucolic Mornington afternoon when I ask Langdon what she thinks is required, in order for Australians to get behind the idea of saving this wilderness they’ve never seen, and these animals that they’ve never heard of. We have just eaten the entire contents of a gourmet picnic hamper, after a lazy swim in the sun-warmed rapids of the Fitzroy, and she remains silent for a long time before answering. Combine those challenges with the fact that there’s a charity or fund to save almost every endangered animal on the planet, she says, and the Australian message becomes almost impossibly diluted. “How is the little gouldian finch, or a hairy-nosed wombat, supposed to compete for conservation dollars with the orangutans or the elephants?” she asks. “Very few people would notice if the gouldian finch disappeared. But a world without elephants… or sharks…” she trails off. But surely people notice when a spectacular wilderness like this starts to disappear – don’t they? “Actually, I think most people still aren’t aware of what’s here,” she counters. “I’d imagine most Australians, if you asked them about the Kimberley, would think ‘barren, hot, not much to see’. Do Australians consume too much media? What does that mean? She smiles. Langdon grew up on a farm in the small town of Wauchope, near Port Macquarie in New South Wales: an upbringing that she credits with making her “sturdy”. Perhaps not. But, among certain Australians at least, there is an unmistakable shift in perspective taking place. In 2012, AWC became the first non-government organisation to be contracted into managing public conservation land – a quiet, but important acknowledgement (“our model for conservation is definitely being noticed,” agrees Fleming). Mornington’s fire management plan has also become the largest of its kind in Australia. 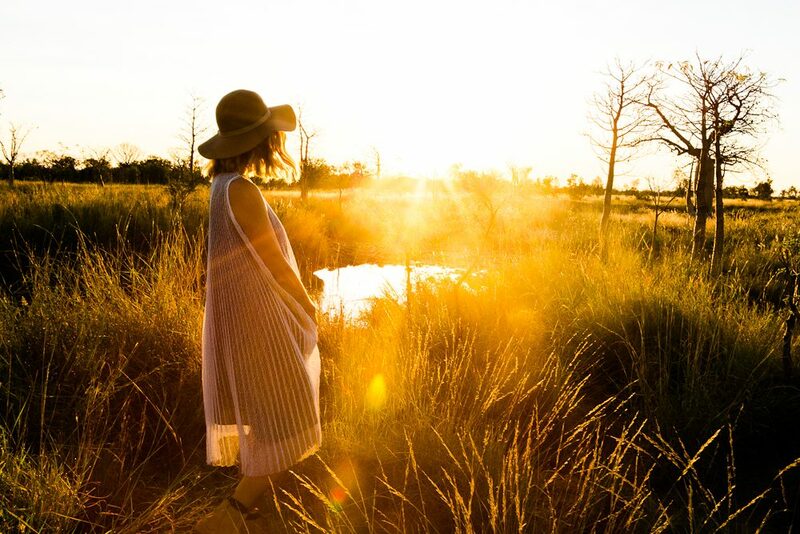 And if the upward direction in Australia’s wilderness tourism is anything to go by – a trend currently increasing by three per cent each year, according to The National Environmental Research Program – then there is hope for public awareness yet. “I do think we’re at a point where people are incredibly concerned about the environment and want to do something to save not just Australia, but the planet,” Langdon agrees. And travelling is an important part of the education process, she adds. “Mornington is an amazing opportunity for anyone,” she says. “You can come here as an Australian, having no idea of the amazing creatures we have in this country, and go back, spread the message and hopefully prompt interest and awareness in others. She pauses. It is hard to finish that sentence. But you can appreciate what she’s trying to say. In a place like this, where space and time feel infinite, it is easy to have much to hope for. 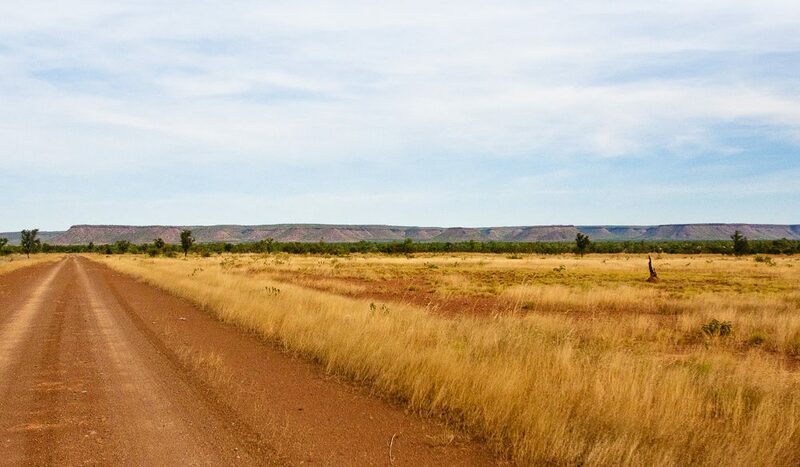 The turnoff to Mornington Wilderness Sanctuary is found on Gibb River Road (from Derby, it’s on the right-hand side of the road about 20 minutes after Imintji Roadhouse; from Kununurra it’s on the left, about 20 minutes past Adcock Gorge). It is clearly signposted. At the turnoff, you’ll see a small shed on the right – pull over here and use the radio to let the staff at the camp know you are on your way. (Very Survivor.) From that point, it is a two-hour drive to the camp, and an absolutely spectacular one at that. Sites at the (generator-free) campground are $18.50 per night, but if you’re a fan of the mattress, book one of the 10 semi-permanent safari tents here. At $258 per person, per night, they might not sound cheap, but the price includes a fully stocked mini-bar, canoe hire and all meals each day – a full breakfast, your lunchtime picnic hamper (ask for the couscous salad!) and possibly The Gibb’s best dinner. (Sample menu: saltwater barramundi with sweet potato mash and ginger; blanched green beans with almond slivers and herbs, olive oil mushrooms with parsley, and from-scratch brownies with fresh cream.) Plus, your money goes back into AWC’s conservation work. • You’ll need to book your safari tent stay ahead of time – they’re very popular. • Just 50 visitors are allowed into the campground at any one time and forward bookings aren’t taken – it’s first come, first served. Radio your reservation down on the day, any time after 7am.